In a potentially alarming early warning signal for TV’s national advertising currency, an advanced neuroscientific study on the impact that “second screens” and other distractions have on people’s ability to view and engage with television found that the presence of a second screen might also impact the way Nielsen panelists respond to people-meter prompts. The study — which is part of an ongoing series of research commissioned by the Council for Research Excellence to understand the nature of watching TV in the current viewing environment — was conducted by Nielsen Consumer Neuro, which utilizes a variety of biometric measurement techniques to understand people’s conscious and unconscious interaction with media. The findings of the study (see related story with detailed coverage here), dubbed “The Mind of the Viewer,” were described as preliminary, especially the part testing response to people-meter prompts, but it suggested that the kinds of media distractions impacting the way people consume media may also be impacting the way the industry measures how people consume media. 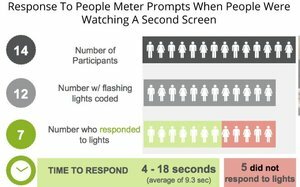 When it comes to interacting with people meters — the technology that is the basis for producing national TV’s advertising currency, Nielsen national TV ratings — 25% of Nielsen people-meter panelists participating in the study did not respond to their prompts because they were looking at a second screen when the meter prompted them with a light. Marci cautioned that the findings were “not conclusive” and based on a very small sample, but they are the first scientifically objective glimpse of the impact of second screens on Nielsen’s core TV research methodology. The people-meter findings were based on data from only 12 participants in a laboratory study measuring people’s conscious and unconscious interactions with TV in a variety of situations — solo viewing without a second screen present, co-viewing without a second screen present, solo viewing with a second screen present and co-viewing with a second-screen present.